Dr. Kakarlapudi grew up in Kansas City and received his B.A. in Biology and an M.D. in 1998 (graduation of B.A. and M.D. with distinction) from the University of Missouri-Kansas City School of Medicine. Dr. Kakarlapudi was accepted to medical school directly from high school. He graduated at the top of his medical school class. He was inducted into the Alpha Omega Alpha Honor Medical Society, Phi Kappa Phi Honors Society and placed first in the University of Missouri-Kansas City School of Medicine Research Days. He completed his internship in general surgery in 1999 and his residency in Otolaryngology-Head and Neck Surgery in 2003 from the University of Maryland Medical Center. In 2009, Dr. Kakarlapudi earned a MBA in entrepreneurship from the University of Louisville. His vision of developing a comprehensive ENT and Allergy practice along with his leadership skills were instrumental in the formation of Advanced ENT and Allergy. Dr. Kakarlapudi is board certified in adult and pediatric otolaryngology and facial plastic surgery by the American Board of Otolaryngology. 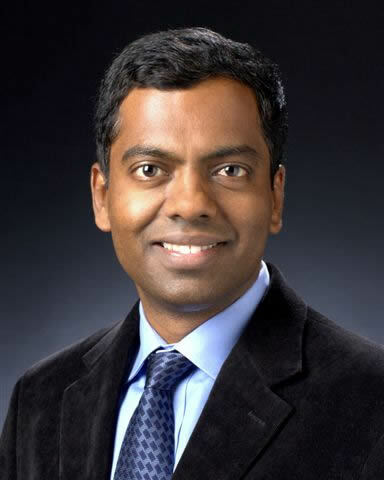 In 2013, Dr. Kakarlapudi successfully passed his Board Recertification as recommended by the American Academy of Otolaryngology.He is one of four ENT doctors in the area who have earned fellow status of the American Academy of Otolaryngic Allergy given his expertise in managing allergic problems in the head and neck. Dr. Kakarlapudi has a passion to incorporate the latest and most cost-effective treatments for ear, nose and throat disorders. Dr. Kakarlapudi, along with another partner, werethe first in theLouisville area to perform balloon sinuplasty. Dr. Kakarlapudi has a particular expertise in the medical and surgical treatment of sinus and allergy problems; pediatric ENT problems; obstructive sleep apnea; thyroid and parathyroid diseases. In his free time, he runs, plays tennis and enjoys time with his wife and two young children. In following Dr. Kakarlapudi’s interest in cost effective solutions to common ENT problems like breathing, sinus infections, and snoring, he has incorporated the latest high tech solutions that can be done in the office to help you breathe and sleep better and reduce your sinus symptoms. These include balloon sinuplasty, in office turbinate reduction, VIVAER, and Pillar implants. Join Advanced ENT and Allergy on Facebook! "Diagnosis and plan of treatment by Dr. K was thoroughly explained to me before surgery. I was especially happy to hear that one of my sinus cavities had cleared up and the rest of the breathing area, even down to my lungs could clear up and give me less trouble. The surgery went well and also recovery. I would recommend the procedures to others suffering similar sinus discomfort/problems." "I've had a wonderful experience here. I was terrified when I head the words "cancer". Dr. K and his staff were so caring and understanding. He explained my next steps in words I could understand. He always comforted me when I would get tearful. He me with me before and after both surgeries to again, reassure and check on me. Dr. K saved my life. I can't tell you how grateful I am to him and my scar looks great! I am his #1 fan for sure!" "Exciting and thoughtful, Dr. K explained everything professionally where I could understand my problems and explained exactly what he was going to do to correct them. After surgery I actually felt I need to learn to breath properly again. It was awesome." "My experience has been absolutely wonderful. Dr. K was very thorough and understanding. He explained the procedure and answered all of our questions. He even took pictures of my sons tonsils per my son's request so he could see how by they were." "The balloon sinuplasty procedure created minimal discomfort, somewhat similar to having a tooth filled. I could breathe better immediately. There were no secondary side effects and no more headaches." "I had sinus surgery by Dr. Kakarlapudi on a Wednesday. Packing was taken out the next Monday. From that time on I have been able to breathe through my nose. Add in the sinus wash , just keeps things great. I would recommend having sinus surgery if having trouble breathing through the nose." "I had a septoplasty performed by Dr. K over two years ago. Between my allergy injections and surgery, the results have been life changing." "The staff is very knowledgeable and pleasant. I came in the office not being able to breath through my nose and was always on antibiotics. After seeing Dr. K, he told me about the Balloon procedure. During and after the procedure the staff and doctor was there for every need I had and comforted me. I can now breath without any problems. Big thanks to Dr. K."
"I had a wonderful experience. Everyone was very courteous and informative. Dr. K explained everything and I was completely at ease." "I've had a pleasant experience with Dr. K. He took care of the cancer in my nose. He did a wonderful job. I am really happy with his work." "Very comfortable office. Friendly. Caring."